She earned her Ph.D. from the University of Wisconsin-Madison in 1983. 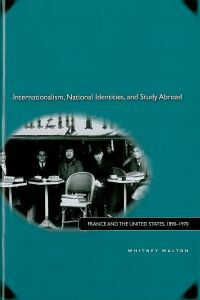 Her most recent book,Internationalism, National Identities, and Study Abroad: France and the United States, 1890-1970(Stanford University Press, 2010), analyzes how students abroad experienced challenges to national stereotypes, re-evaluated their own national identities, and learned toleration and appreciation for cultural difference. In other words, this study explains how young people from France and the United States become internationalists while retaining national identities. The research for this book was supported by a Spencer Foundation Small Research Grant in 2002, a College of Liberal Arts Center for Humanistic Studies Fellowship in 2004, and a Fulbright Research Scholar Award in 2005. Walton is also the author of Eve's Proud Descendants: Four Women Writers and Republican Politics in Nineteenth-Century France (Stanford University Press, 2000), a biographical study and historical analysis of four female literary figures, including George Sand, who rescripted republicanism to include a public role for women by offering an egalitarian alternative to the patriarchal family and the gendered separation of spheres. France at the Crystal Palace: Bourgeois Taste and Artisan Manufacture in the Nineteenth Century(University of California Press, 1992) - argues that bourgeois consumer preference for stylish and tasteful goods contributed to the persistence of handicraft manufacturing in France during the Industrial Revolution. She has also published numerous articles and book chapters on nineteenth-century French social, cultural, and women's history, and on Franco-American cultural relations in the twentieth century. Current projects include forthcoming articles on Arvède Barine (1840-1908), a successful historian and author, and Charles-Alexandre Lesueur (1778-1847) a French naturalist and artist who traveled extensively and spent some twenty years living in the United States.